With an online presence of more than 113,000 followers on Instagram, Ray Chen is not your grandmother’s violin virtuoso. Chen arrives in Atlanta this week to play a recital of Vitali, Franck, Bach, Debussy and Ravel with pianist Riko Higuma at Emory University’s Schwartz Center on January 25, as part of the Candler Concert Series. But while in town, he’ll also teach a master class to both undergraduates and high school students affiliated with Emory’s music program. 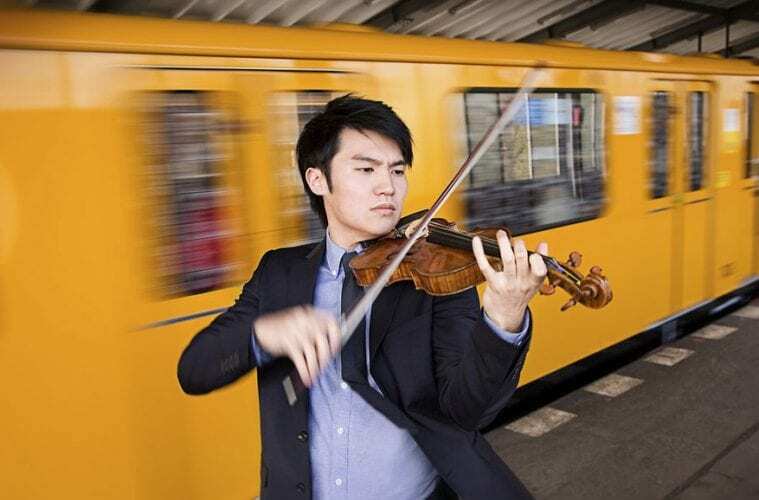 At 29 years young, the violinist has taken the classical music world by storm. Born in Taiwan, raised in Australia and educated at the Curtis Institute of Music in the U.S., Chen can play all of the standard repertoire that you’d expect from a seasoned musician including Saint-Saëns’ Introduction and Rondo Capriccioso, Korngold’s Violin Concerto in D-major, Op. 35, Bruch’s Violin Concerto No. 1 in G-minor and more. But, it is Chen’s youth and tech-savvy persona that gives him the ability to connect with the next generation of classical musicians. ARTS ATL recently talked with two young violinists who will be playing for Chen: Hyerin Yoon and Harriet Skowronek. Yoon is an undergraduate at Emory from New York, NY who started playing violin at 4-years-old. Skowronek is an aspiring music major and member of the Emory Youth Symphony, who attends high school in Atlanta. ARTS ATL: What are you most looking forward to in working with Ray Chen? Hyerin Yoon: I’m very excited to work with such a renowned violinist as Ray Chen. In every piece that I’ve seen and heard Chen he always plays with emotion. I hope to learn, during this masterclass, how he manages to channel such emotion into his pieces. I want to be able to understand how he expresses himself through different works and apply some of these techniques to my own music. Harriet Skowronek: I have seen Chen perform with the Atlanta Symphony Orchestra and greatly admire the way he conveys the essence of a piece to his audience. I look forward to his suggestions for being an engaging, expressive performer. ARTS ATL: What will you be playing for Chen in the master class? Yoon: I will be playing part of Bach’s Chaconne, from Partita No. 2 in D-minor for solo violin in the masterclass. In my opinion, this piece exudes many different emotions and allows the player to express him or herself. There are so many different ways to perform the music and I believe that this piece is unique to every single person who plays it. Through the masterclass, I hope to gain a more profound understanding of the piece, as well as be able to apply the different techniques that Chen teaches me to all the pieces I play in the future. Skowronek: I will be playing the first movement of Camille Saint-Saëns’ Violin Concerto No. 3 in B-minor. I love that this movement brings together two such different characters: one is passionate and romantic and the other sweet and airy. I hope to work with Chen on connecting these two contrasting aspects of the piece. ARTS ATL: How has your playing evolved during your studies at Emory? Yoon: I decided to study at Emory University because it offered rigorous science courses and music courses, both of which I am very passionate about. I continued to pursue music at Emory because I have always found peace while playing the violin and it is what I love to do whenever I am having a bad day. My playing has evolved in many ways during my time, specifically while studying with Jessica Wu, a violin teacher at Emory and founding member of the Vega String Quartet. From participating in various chamber ensembles to taking classes like music theory, I have improved my ability to communicate with fellow musicians and study a wide array of musical pieces. Since coming to Emory, I’ve been able to tackle more difficult pieces including the third movement of the Tchaikovsky violin concerto, which I played with the Emory University Symphony Orchestra after winning last year’s Concerto and Aria Competition. ARTS ATL: What role will music play in your life after graduation? Yoon: Post graduation, I envision myself playing the violin as a hobby. I would love to participate in local community orchestras as well as other volunteer opportunities. Additionally, I would love to use music to aid in occupational therapy. After college, I plan to attend dental school. However, I plan on continuing to play the violin during this time. Skowronek: I hope to study violin performance and attain at least a master’s degree. Professionally, I aspire to play chamber music and teach.